An Avon Sabre jet A94-959 erected by the Raymond Terrace Lions Club commemorates the 60th anniversary of the Royal Australian Air Force and 40 years at Williamstown. 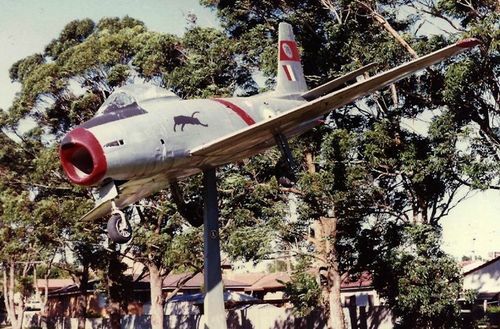 The Commonwealth Aircraft Corporation Avon Sabre, A94-959, is an aircraft dear to the hearts of many Raymond Terrace locals and highway travellers. On the 24th February 2013, the Raymond Terrace Sabre was moved from Bettles Park in Raymond Terrace to Fighter World in Willamtown for restoration and display. The local icon had adorned the plinth at Bettles Park since 1981 and is the subject of a book by Trevor Boughton. The Sabre will be carefully restored to display standard under the custodianship of Fighter World after spending 31 years as the ‘silent symbol of the Raymond Terrace Lions Club community work’ and then displayed on the original plinth at the entrance to Fighter World.